LENDER APPROVED PRICE! Large estate home on quiet cul de sac. 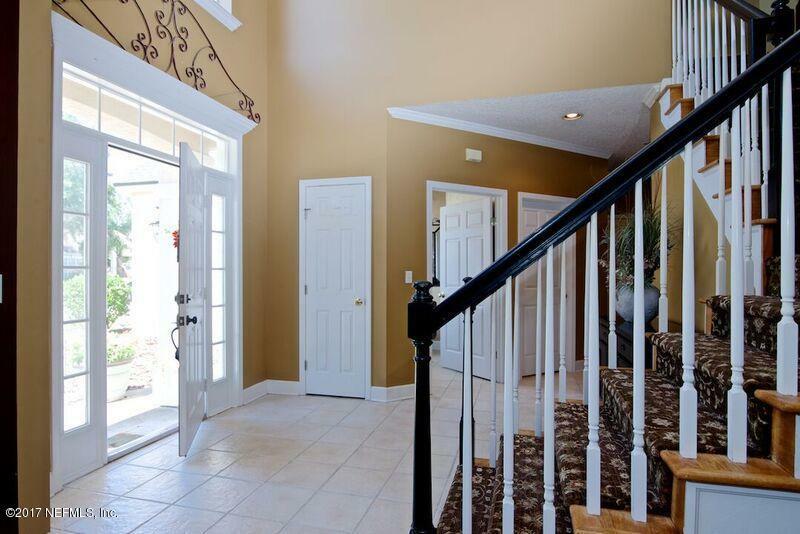 Grand entry foyer with soaring ceiling and large windows. Spacious kitchen has ample counter space and granite countertops. Nearby oversized family room with built-ins and tiled fireplace overlooks the screened and pavered lanai and backyard. Separate dining and living rooms are conveniently located off kitchen. Light and bright master bedroom boasts vaulted ceiling and large walk in closet. Luxurious master bath has double vanities, deluxe jetted shower in glass enclosure and oversized whirlpool tub. MASSIVE teen/guest/gym/flex space and three additional large bedrooms w/ adjoining bathrooms on the 2nd floor. New roof 3/17.The family will love to gather in the large kitchen with oversized eat- in breakfast area. Plenty of counter space, including the large island with drop- in Jenn Air cooktop. This kitchen is equipped with large pantry closet, decorative tile backsplash and upgraded oil-rubbed fixtures. Adjoining spacious family room has custom built-ins, elegantly tiled fireplace with mantle and several large windows overlooking the inviting screened and pavered lanai and landscaped backyard. The peaceful lanai has two exits- one to the pavered path leading to the front and the other to a massive wooden deck, perfect for enjoying the outdoors on a sunny day. Host the family and friends at your place in the generous separate formal dining room with wainscoting and decorative chandelier. Nearby spacious living room boasts two large windows overlooking the front yard. Convenient powder room and laundry room with cabinets complete the well equipped first floor. All bedrooms on the second floor have a private bath complete with a separate shower/ toilet room! Two generously sized bedrooms share a Jack and Jill bath with granite countertop, beautiful vessel sink and upgraded lighting. The third bedroom has a private entrance to the "hall bath" also with separate shower/ toilet room. The whole family will enjoy the gigantic nearby flex room(s). Flex suite has its own closet, vaulted ceiling and large windows to keep it light and bright for any use! The tranquil master suite boasts dramatic vaulted tray ceiling and huge windows overlooking the serene backyard. Deluxe master bath features upgraded jetted shower with glass enclosure, luxurious whirlpool tub and his and hers vanities with decorative tile backsplash, granite countertops and vessel sinks. Some additional features of this home are: New roof in 3/2017, oversized side entry three car garage, quiet cul- de- sac location, and so much more!